^ a b c d Ferri, Fred F. (2017) (英語). Ferri's Clinical Advisor 2018 E-Book: 5 Books in 1. Elsevier Health Sciences. p. 357. ISBN 9780323529570. オリジナルの15 December 2017時点によるアーカイブ。. https://books.google.ca/books?id=wGclDwAAQBAJ&pg=PA357. 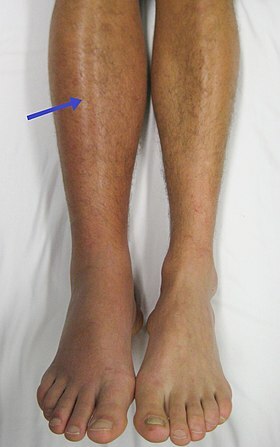 ^ a b “Racial differences in venous thromboembolism”. J Thromb Haemost 9 (10): 1877–82. (2011). doi:10.1111/j.1538-7836.2011.04443.x. PMID 21797965.